We’re past the halfway mark in exploring Mentoring Basics. This post is the third of three posts on “how to start a mentoring relationship”. If you’re new to this series, you can start at the beginning by clicking here. As we’ve discussed in the last two posts, starting a mentoring relationship correctly is nearly as important as the mentorship itself. And you as the mentor are in the position to ensure it gets started correctly. In Mentoring Basics: 3(a) we discussed the importance of asking good questions to understand the what’s and why’s behind the potential mentee’s motivations. In Mentoring Basics: 3(b) we talked about the importance of honestly assessing the answers to the questions and ensuring they line up with where you are and who you are as a mentor. Asking the questions and assessing the answers should put you in a place where you can make a decision about whether to say ‘yes or no’ to the relationship. Now, we’re going to talk about HOW to deliver that decision and set expectations in the relationship. We’ll start with the NO. This is a delicate conversation as a leader. No one likes rejection. And as a leader, you should feel that you have an obligation to lift others up and improve their situation; even if the answer is no. First, let’s cover where you say it. I suggest finding a place away from others where you two can talk in a more private setting. This is a tough message and you want to mitigate any potential embarrassment. Second, let’s talk about what you say. I would begin by thanking them for considering you. It should be very humbling for someone to seek you out as a mentor. Acknowledge and appreciate them for that. From there, my suggestion is to be very honest. Since the answer is ‘no’, then tell them why. Don’t have the time to commit? Then say so. Don’t think you’re the right fit? Then say so. Don’t leave them wondering. I also suggest that you are very clear in the words you use. If you aren’t clear with what you say, it may leave room for vague interpretation and them not understanding it’s a ‘no’. This is similar to nicely ‘ripping the Band-Aid off’. They should leave the conversation knowing that the answer is ‘no’. Finally, let’s look at how you say it. I’m sure that you’ve heard before that HOW you say something is just as important as WHAT you say. This is one of those situations that this is definitely true. Again, no one likes rejection. So, the tone and manner in which you convey the message becomes critical. Be aware of your body language and focus on delivering the message. Try to find a way to keep the conversation upbeat. One way to do this is by helping them succeed. If you say ‘no’, how can you help them find a ‘yes’? Can you suggest another mentor? Introduce them? Suggest another method for them to learn what they want to learn? Perhaps it’s to not enter in to a formal mentorship, but instead to provide intermittent support, an occasional lunch, and/or be there to ‘bounce things off of’. Establishing expectations and boundaries is very important at the beginning of a relationship. The key here is to be very honest with them about your expectations and how you want this relationship to work. Let them know how you operate as a mentor. What are they in store for? Set the goals of the mentorship and expected outcomes. Set expectations around frequency of meetings or changes to meetings. Set expectations around any additional work you may be giving them (e.g., assignments, accompaniment on work trips, etc.). Be honest that you may have some conversations with their supervisor (if this is the case). Let them know if you are going to need any personal documents (e.g., past evaluations, etc.). Set a time limit on the mentorship. Again, this is not a complete list, but includes many key expectations that should be discussed or at least considered. One of the most important expectations that is rarely discussed, is the time limit. This is one that I personally have failed at many times. Mainly because I never knew how important it was. If you don’t set or agree upon a time limit in the beginning, it means that you’re left with an awkward or ambiguous situation in the end where things just tend to dwindle off. Learn from my past mistakes here, it is better to set this in the beginning than try to deal with it later. Some of the more successful mentorships that I have been involved with as a mentee have been where a time limit was set. Specifically, besides eliminating the awkwardness at the end, it told me that I had a specified amount of time to accomplish what I was setting out to do. And a good mentor will help keep the mentee on track. If you don’t know how long you should structure a mentorship for, I suggest looking in the 6 month to 1-year range. It’s long enough to get some big things accomplished, but not too short that you are creating a burden of time on yourself or the mentee. Between the last three posts, you should have a better understanding of the three key steps in starting a mentoring relationship. Setting Expectations – setting parameters to ensure a productive relationship. These steps are good tools to put in to your Leader’s Locker that should help set you up for a successful mentoring relationship. What happens next is the follow through during the course of the relationship. In the next post, we’ll talk through some key mentoring “do’s and don’ts”. In our last post on Mentoring Basics, we examined the first of three steps in ‘how to start a mentoring relationship’. Critical here, was gathering information that would help us as potential mentors make a decision to mentor or not to mentor someone. Now, we’re going to take that information and dive in to the analysis and decision making step, which we’ve termed Honest Assessment. If you’re joining us at this mid-point in the series, you can start at the beginning by clicking here. Honesty is critical. Not only in the way that you approach the mentoring of another person, but also in your assessment of the whether or not you are the right person to mentor an individual. Just because someone asks you to be their mentor doesn’t mean that you are the right person for the job. It is very important that you examine the information you have collected carefully and run it through your honest assessment filter to make a good determination. Let me give you a work place example. Sue asks Adam to be her mentor. Adam asks Sue, “what would you like to learn?” Sue tells Adam that she thinks Adam is really strong in merchandising skills and would like to learn that from him. Adam knows deep down that his merchandising skills really aren’t that strong. Should Adam agree to the mentorship based on Sue’s expressed need? Or should he decline and refer Sue to someone else that may possess the knowledge, skill and experience that she is looking for? Personally, I would say that the latter would be more appropriate in this situation. We all like it when people look up to us for some reason or another, but if that admiration is based upon misperception is it really us that they admire? Or is it some alternate universe version of us that only exists in their mind? Should you burst the perception bubble? Human nature may be telling you no. I say this is a bridge that you will have to cross personally. You may be thinking if there is no harm is there a foul? Perhaps there isn’t, but I encourage you to “burst the bubble” if the situation involves someone asking you to teach them a skill that they will be basing future action upon and you clearly don’t have the expertise to lead them down the right path. Do I have enough information? If not, go back and ask clarifying questions. Don’t be afraid to seek out information from others too (e.g., other former mentors, their supervisor, etc.). Are the goals realistic? This is a tricky one. You have to make a judgment as to whether or not the needs and goals are attainable by this individual in the time frame that they expect to reach them. If they aren’t, then this doesn’t mean that the mentorship shouldn’t occur, it just means that you may need to reset the expectations of the goals and time lines (which we will cover some in the next post). However, if they are dead set on achieving that specific goal (and you don’t think it’s realistic), you may have to say no. Does this person display a desire and capacity to learn? This is an important question, because if the mentee’s heart and mind isn’t in it then the mentorship may be a waste of time. The important thing here is attitude and aptitude. Do I have the knowledge, skills, or experiences to help them achieve their goal? The above example of Sue and Adam fits right in to this question. Do you honestly have what it takes to develop someone in a given area? Is this a mutually beneficial relationship? Mentoring is reciprocal and you should be getting as much from it as you are giving. Am I compatible with this person? This is more important than you may think. While we don’t want a bunch of ‘mini-me’s’ running around and you should consider people that are different than you as mentees, there is the fact of whether or not you will get along, which speaks to how receptive they will be of your input. If you think the relationship is going to be abrasive or adversarial, then you may want to pass. Do I have enough time and energy to devote to this person? Now that you have the information, you should be able to determine if you have the time to devote to this specific individual. This isn’t all about the mentee either, this is about you, your priorities, your workload, your energy level, etc. We’ve talked a lot about “time” as a factor, and that’s because this is one of the greatest fatal flaws of mentorships that often dooms them to failure. So make sure you are honest with yourself about what you can “give”. Notice how all of these questions are “yes or no”? This should make it easy to assess. If you answer “no” to any of them, then you need to take a really close look at this potential relationship. If you dig further for answers and still get a “no” then you are probably leaning towards a “no” for the mentorship in general. Now, the application for this rigorous of an examination may lend itself more towards the “official” or even “casual” style of mentoring relationships. Note that if you come up with a “no” for the relationship, that still may mean that you can contribute to this person’s development by answering questions from time to time, being an “ear” or allowing them to bounce an idea off of you. You may be looking at all of this information and analysis and think, “Good grief, it’s just a mentorship. Do I have to go through all of these steps?” The answer is yes. Why? Because mentorships should be taken seriously. They are an investment in one of our most precious resources: time. The time that it actually takes you to conduct the assessment may vary. Skilled mentors may have this process down pat and can go through all the steps within minutes. More complex situations may require further analysis. Regardless, take the time you need to make the right decision. It’s okay to tell them, “let me think about it” and give yourself the time you need think and assess. Just make sure you don’t leave them hanging too long. Now that you have all the information you need and you’ve assessed the situation, you should be prepared to make an informed decision. HOW you deliver that decision and the next step (setting parameters) will be covered in the next post! Stay tuned! The time has come! It’s time to start a mentoring relationship with a mentee. This is a critical step in the mentor/mentee relationship process. It sets the tone for all that is to come. But how do you start? What do you need to do as a potential mentor? In Part 1 and Part 2 of this series we defined mentoring and discussed some of the different types of mentorship. This should serve as a base for you to make decisions from in this next stage. As discussed in Part 2, the key factor of TIME should be addressed first and foremost. How much time do you have to devote to the development of another? If you agree to a mentorship, but don’t have the time you’ll likely do a serious disservice to yourself and to your mentee. The impacts of a poor decision are many; starting with your reputation as a mentor. In addition to understanding how much time you have to commit, having good self-awareness and knowing your own strengths and weaknesses is very important for would-be mentors so that when the “will you be my mentor” question comes (and it will come) you are prepared to assess and answer. In writing this portion of the article, I found that there was lots of rich information to share, but when I put it all together it was rather long. So, in the interest of not creating the longest blog post ever, I have decided to break Part 3 in to three separate posts. This will make the overall series longer, but I think will make it much easier to digest. In this post, we will tackle Step 1: Relationship Initiation. A mentoring relationship can start a variety of ways. You may be assigned an official mentee through a formal program, you may ask someone to be your mentee, or more often than not, someone is going to ask you to be their mentor. If someone asked you that question right now, how would you answer? Hopefully you won’t default to that ‘deer in the headlights’ look. And I also hope that you won’t respond with an immediate ‘yes’ or ‘no’. Think about this for a second. Someone (most likely junior to you) has mustered their courage to tell you that they admire you as a leader and are asking you to develop them all the while knowing that you may reject them at any second. And no one likes to be rejected. So, HOW you answer this question is just as important as the mentorship itself and must be handled delicately and with thought. Many novice would-be mentors think that they have to provide an immediate answer, but this simply isn’t the case. A thoughtful answer is much better received than a hasty one. What do you hope to accomplish/learn? Why ask the questions? It pauses the need for an immediate response, changes the dynamics a bit, gives me time to think and assess, and allows me to draw out more information from which I can make an informed decision. If I don’t know the person very well, I may also ask them to tell me more about who they are, their situation, and their goals/aspirations. The art of listening is critical here. Listen for what their true need is. It may require follow on questions to get to the root issue, instead of what may be presented initially. Use open ended questions. Don’t be afraid to dig here, because it will set the foundation for your decision and for the mentorship. Plus, it gives you an opportunity to determine how forthcoming and receptive to suggestion your potential mentee really is. This line of questioning works more for situations where someone wants to establish a mentoring relationship (official or casual); as compared to someone that just has an infrequent development or perspective question. Although, listening and asking good clarifying questions may be important in the latter too. Gaining clarification of what the potential mentee is really looking for is critical so that you can properly assess whether or not you would be a suitable mentor. Even if you know immediately that you don’t want to mentor this person, taking the time to ask the questions shows thoughtfulness and consideration. Even if the answer is ultimately ‘no’, the feeling of rejection may be mitigated somewhat because you have been thoughtful and you have acknowledged them and their need. But don’t make your decision just yet! Now that you have the information, you need to assess it. Honest assessment will be the focus of the next post. Mentoring is such a great topic. Most people genuinely want to be mentored, cultivated, and grown. Unfortunately, would-be and well-intentioned mentors aren’t always equipped with the right tools in their locker to be a successful mentor. And when this is the case, the mentoring relationship is rarely successful and people are left disappointed. Mentors have to work at this aspect of their lives just as much as they work at any other that they want to be successful in. That is why we’re exploring mentoring from the mentor’s perspective in this five-part series of posts on Mentoring Basics. In the last post (Part 1), we defined mentoring. In this post, we are going to talk about putting structure around your mentoring relationships. Before we jump off in to discussing mentoring structures, I want to pause and discuss one key factor that you should examine closely before you decide to become a mentor. When approaching mentoring as the mentor, one of the most important factors is TIME. How much time do you have to give? How much time do you want to spend? You don’t want to sell your mentees short and you don’t want to do yourself a disservice if it is more time than you can afford at the moment. Be honest with yourself here. Many of us “want” to donate and invest more time in others, but you have to be realistic. If you need to reprioritize your time to spend more time mentoring, then do so. But don’t commit to it if you don’t have it. There are several different ways to classify mentoring relationships. There is no one right way. Personally, I have lots of different types of mentors. Some are official, where we meet regularly and discuss pre-determined development topics. Others are more casual where I may drop in and “bounce something off of them”. Some educate and counsel me while in a group setting. And others are a lunch date every so often to catch up and hear about their business. One of the first considerations you need to determine as the mentor is how you want to approach mentoring. Do you want to be more one-on-one? Or do you want to take the “one-to-many” approach? Each provides a means to an end and has its own benefits, but each has very different requirements on the part of the mentor. One-on-One mentoring is very personal. It’s an opportunity to talk specifically about the development need of a single mentee and develop a very precise plan of action to target areas of opportunity. The focus is very narrow as you are only dealing person, which allows you to “go deeper” in to their needs, but also means that you will be more personally invested. Very targeted mentoring of skill or knowledge. Confidential and unbiased support for the mentee. Usually instructive based upon the needs of the mentee and the lesson that the mentor wants to teach. A rich investment of time in one person. More personal to the mentor and mentee. Successes and failures are more readily felt. 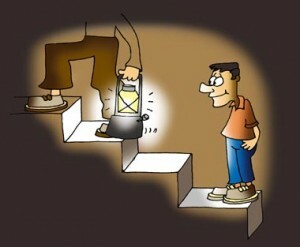 Provides a single perspective back to the mentee. Group mentoring is a “one-to-many approach” that goes by a variety of names (e.g., mentoring ring, mentoring circle, etc.). There are several ways to conduct group mentoring. There is no “one ” way to do it. You can bring people with a similar need together to develop on that need. Or you can bring people with diverse backgrounds and experiences together to create a multi-perspective environment where issues are discussed. It really depends upon what you want to accomplish. With this approach, I often see mentors spending a great deal of time on preparing group lessons and “pre-reads” for group discussion. More general mentoring of skill or knowledge. Confidential and unbiased support of a group of mentees. How forthcoming people are in a group though depends upon the level of trust of the group and environment that the mentor creates. Provides general instruction on topics that apply to many. However, usually involves the mentor playing more of a facilitator role amongst the group to elicit conversation about the topic and to keep everyone engaged. Maximizes mentor’s time investment and reach. Provides multiple perspectives back to each mentee due to group involvement. So, at this point we are at a cross-roads. Which type is more appealing to you as a mentor? Do you see yourself as a group mentor? Or an individual mentor? Or both? If you are new at this, then I suggest that you start with one-on-one relationships. This will help you gain experience and develop your personal style as a mentor, before taking on multiple mentees at once. For the sake of the length of this post, we will focus the remainder of our attention on one-on-one mentorship as this type is more prevalent. We’ll reserve a deep dive on group mentorship for a future post. How you go about one-on-one mentoring can take many forms. Official. Unofficial. One time. 30 seconds here and there. Long durations. Grow a skill. Share a story. Help with a problem. So on and so forth. “How” you go about mentoring is often determined once you know the “who”, “what” they want to accomplish, and “why” they are asking you (which we’ll discuss in the next segment of this series). Infrequent – Be the ‘go to’ for people that have a single quick question or issue that they need help with. This often sounds like, “Hey…Can I bounce something off of you really quick?” or “Have you ever experienced…?” The expectation here is isolated one time help and not a continuous mentoring relationship. Casual (aka “unofficial”) – This is probably the most frequent of relationships classified as “mentorships”. I have far more “unofficial” mentees than I do official mentees. These relationships are usually loose in structure, sporadic in meeting frequency, and come and go based upon need. I have found this style very useful as it allows me to invest time in others in a very casual, but effective manner. Official – This relationship is typically the most demanding. It requires structure, regular frequency of meetings, agreed upon goals, and then action towards meeting the goals. The time investment here is usually greater. This is a committed mentoring relationship. At work, this relationship often falls under a company mentoring program. This doesn’t define all the ways that one-on-one mentoring can take place, but buckets the majority fairly well. If you’re interested, there are many free mentoring resources out there that further define relationship types. Think about your mentoring relationships where you are the mentor OR the mentee. How would you classify your relationships? In the next part of the series, we will get in to how to tackle that question and how to start a mentoring relationship. Mentoring is such a great topic. There is no greater personal legacy than that which you invest in others. Mentoring is universal and can be done just about anywhere; at work, at home, at school, at church, with a child, with a student, with a team, with a co-worker, and the list goes on. There’s nothing like seeing people that you have invested time and effort in go on to do great things. Personally, I don’t think I have always been a good mentor. In fact, in hindsight, I can think of former mentees that I could have done so much more for, but quite honestly at that point in time I didn’t have a lot of experience in mentoring and/or didn’t have the tools in my locker to be a good mentor. Even today, I know that I have a long way to go to reach the level of some of the great leaders that inspire and mentor me, but I am better than I was yesterday and I learn every day. Mentoring is just as much about the mentor learning how to grow others as it is about the mentee learning from the mentor. For the purpose of this series of posts on Mentoring Basics, I am going to approach the topic from the “role of the mentor”, but I think the lessons have equal application for mentees as well. I am also going to approach it from a business standpoint, but again, I think the lessons have equal application in mentoring relationships outside of the workplace. A great place to start this conversation is around defining what mentoring is in the first place and how it differs from management. In doing a little research, I found the following, which I thought was a good explanation from www.management-mentors.com. Mentoring is a relationship between an experienced person and a less experienced person for the primary purpose of helping the one with less experience develop and/or reach their goals. The mentor provides wisdom, guidance, advice and counseling as a mentee advances in their life, career or education. What is the difference between a manager and a mentor? While many managers demonstrate mentoring behavior on an informal basis, it is very different from having a structured mentorship. There is a qualitative difference between a manager-associate relationship and a mentor-mentee relationship. The manager-associate relationship focuses on achieving the objectives of the department and the company. The manager assigns tasks, evaluates the outcome, conducts performance reviews, and recommends possible salary increases and promotions. Because managers hold significant power over associates’ work lives, most associates demonstrate only their strengths and hide their weaknesses in the work environment. The mentor-mentee relationship focuses on developing the mentee professionally and personally. As such, the mentor does not evaluate the mentee with respect to his or her current job, does not conduct performance reviews of the mentee, and does not provide input about salary increases and promotions. This creates a safe learning environment, where the mentee feels free to discuss issues openly and honestly, without worrying about negative consequences on the job. This is a basic contrast, but does provide some boundaries on the roles of managers and mentors. In the next part of the series, we’ll look at how to put some structure around the mentoring relationship.